He never talks to me anymore. He never talks to anyone anymore. His eyes are always closed. I wonder what he sees... Features: -Unique dual story gameplay -Multiple Endings -English and Japanese Language -Loads of graphical effects -A dynamic music system and amazing soundtrack -An exciting and bizarre story -Another exciting and bizarre story -A cool interactive manual -Add your name to the online Hall of Completion -Gods, aliens, samurai, and Charlton Heston *The main download link is in .rar format (42.6 MB). Use Mirror 1 to download a .zip version (71.4 MB). "Challenging and unique. Wonderful dual gameplay may confuse some!" An incredibly creative and original premise for an adventure game. I found it interesting that I zipped though the English version without any trouble but stumbled horribly over the Japanese version. I felt that the completion of the first version constrained or impeded my ability to solve the second version. Very interesting. I'd Highly recommend it to those who like pen-and-paper style puzzles. Clever design, but the puzzle was a little tedious. Well, "Medium length games" is rather over-stating. After finishing the game in 20 minutes I'd rate it as a short one-puzzle (!) mini-game. This is a phenomenal game. The puzzle (not plural) is challenging without being impossible. The dual gameplay is innovative without being too bizarre. However, the most impressive feature is the two totally distinct, but equally wonderful, styles. It would have been so simple to make this a less stylish game, but the designer knocked it out of the park instead. Bravo. This is one of those games that leave you thinking after the end. Moreover, the art is great. 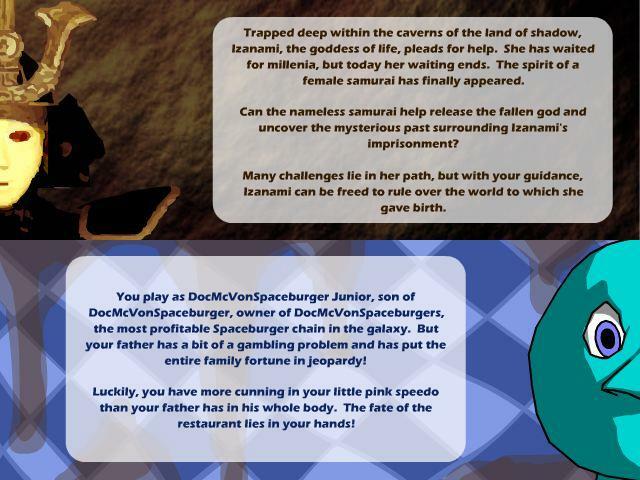 The way the author fitted two games with two completely different stories and very contrasting art styles is impressive. To sum it up, play this game now. It's the only play I've played three times (you'll see why when you play it). More than an adventure this is a logic game with a lot of atmosphere. A single puzzle game, but what a puzzle! Only suitable for people that likes to use pen and paper, deal with incomplete data and put the brain to work. If you are one of these you are going to enjoy it. Oh, I suppose I should post a comment. Brilliant! I'm impressed by the innovation of this game! This game had me glued to my computer throughout the beta testing. It was a pleasure to play. And nice work, Nikolas! Also, I hope you enter OROW V next month or whenever we have it. You seem to have a knack for great one room games. A tricky, very nicely thought-out game, with two original stories. You need to have your wits about you, think logically, work things out carefully on paper, and check everything twice. My sort of game, but not suitable for the sort of person who prefers to guess their way through a game. There is only one (fairly large and involved) puzzle to solve as well. Shamelessly let me say that I worked on the game along with Vince, who was incerdible to work with (and hope to work with him again...). But the main thing is that his idea atracted be to him. The game. The dual mode, the dual gameplay. the grahpics are top notch, especially for someone who is not a graphics artist. The stories are shocking and the 4 endings are... something else.